The polls are open, the pints are packed, and Modern English's "I'll Stop the World and Melt with You" is in my head. Cookie dough vs. mint chocolate chip. I have the same problem with cookie dough ice cream that I have with candy corn: I can't eat just one kernel, or just ten kernels, or just one heaping double handful. I eat it until it's gone, and then I feel desperately ill. Eggnog, same problem, and it's not that I don't love it, but the diabetic gassiness that ensues from our love…I have to maintain a wary bad-break-up distance. Mint chocolate chip is one of my three favorite flavors, and without setting off a compulsive dessert/Maalox chowing cycle, so once again I vote m.c.c. -- but I think the last remaining non-top seed is getting beat this round. Strawberry vs. vanilla. 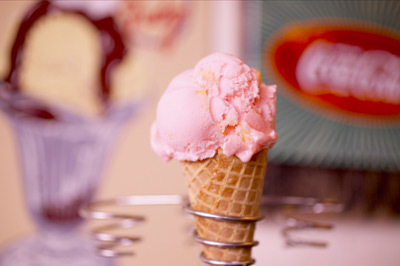 I like strawberry ice cream, but I do have one eensy issue: if it doesn't have big honkin' fruit chunks in it, it tends to taste fake, but on the other hand, the honkin' chunks hurt my teeth because they hold the cold. It's not strawberry's fault; it's because I eat too fast (see: Wing threatening to confiscate my Jamba Juice if I couldn't stop giving myself a brain freeze every 15 seconds), but I am what I am. Also, vanilla is more portable, and I think enough people will vote against strawberry (or for apple pie accouterments) to give the win to vanilla.